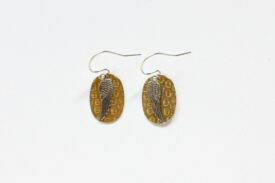 Categories: Earrings, Charm Earrings, Rose Gold & Mixed Metal Charm Earrings. Feel as light as a feather in our easy to wear, and light weight charm earrings. These sweet drops are designed to enhance any outfit, and are lead free and nickel free, making them kind to sensitive ears.